The commercial quality Lifespan S4 indoor cycling bike gives you the opportunity to do a private spin class workout any time and any day in the comfort and convenience of home. The leather resistance knob provides smooth transitions to increase or decrease resistance as it replicates wind and surface resistance, and steep mountain climbs. 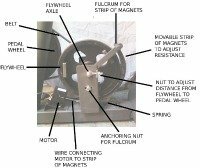 The push brake delivers quick response to stop the flywheel for safety and ease of use. UPDATE: The S4 has been discontinued and is no longer available. Check out the popular S2 indoor bike here. The Lifespan S4 bike has a solid frame made from heavy-gauge steel. 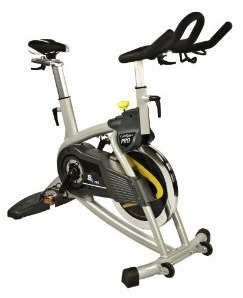 The indoor cycle features a large 44-pound balanced flywheel, a Poly-V drive belt system, and multi-position handlebars that are PVC-dipped with height and fore/aft adjustments. The standard seat mount also has height as well as fore/aft adjustments. The high-density memory foam is comfortable, but can be switched out with any other seat or used with a gel pad. 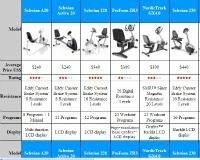 There are a few issues that reviews mention on the Lifespan S4 exercise bike: one is the 2 years parts and 1-year pedal warranty which is somewhat weak compared to what competitors offer. The bike does not have latches for regular spin shoes, only straps for regular athletic shoes. It would be nice to see this bike offered with better quality dual-sided pedals with SPD compatibility, but you can change these cheaper pedals out for something better. Also, a few users point out that the handlebar tends to wobble when a larger rider is pedaling hard. Otherwise, the S4 indoor cycling bike scores well in all other areas. The Lifespan S4 indoor cycling bike is a good-looking, comfortable, ergonomic, easy to use bike. Like any belt-driven bike, it is durable and stays clean with very low maintenance. Its smoothness is not quite up to the Diamondback 910lc at $100 more, but the Lifespan S4 is still a solid choice for $799.